Wow! 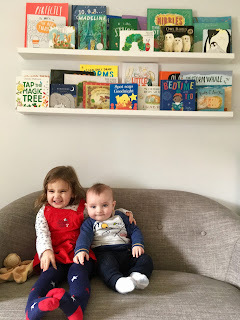 It has been two years since I created my own little corner of the internet full of bookish moments with my beautiful bairns. Life has changed quite dramatically and also in quite small seemingly insignificant ways too since then. We added another little bundle of bookworm to our family and he delights us every day (today he mastered rolling from his tummy back onto his back), I gave up my job and went on a career-break to spend more time at home with BookBairn (and also The Wee Page Turner), I read a lot of books, I have read hundreds of picture books and we have established some wonderful connections with publishers, authors and illustrators whose generosity in sending us beautiful and brilliant books astounds me, and our readership (you wonderful people) has grown. I feel quite proud of myself (which isn't something that come naturally for me to say). When I started this blog my husband asked me "What do you want to get out of it?" and honestly, I wanted a hobby that reflected my interests, a record or diary of sorts of raising my little reader (now readers) and some free books if that was at all possible. Well, I have achieved that and more. We have got free books - lots of them. But I've also connected with people who enjoy reading as much as I do. People who are fascinated by children's books. People who are passionate about raising a generation of readers who are kind, independent, strong, passionate, considerate, generous and mighty. Thank you! Lots and lots of books to discover! Thanks! Can't believe how quick it has gone and how much our lives have changed! Thanks GrUncle! Love that you read along and wanted to comment! See you soon hopefully! Well done Kim. Yourgreat granny Allen and your Great grandpa Clark, both teacher , would. -also have appreciated your work with young children.Keep up the good work. Thank you! And thank you for reading to us! It has made me the bookworm mummy that I am today! Congratulations, Mummy BookBairn. What a great achievement!! Your little readers are just great because of the fab job you and DaddyBookBairn are doing. Keep up the good work. I'm very proud of you. Your bro's not bad either.